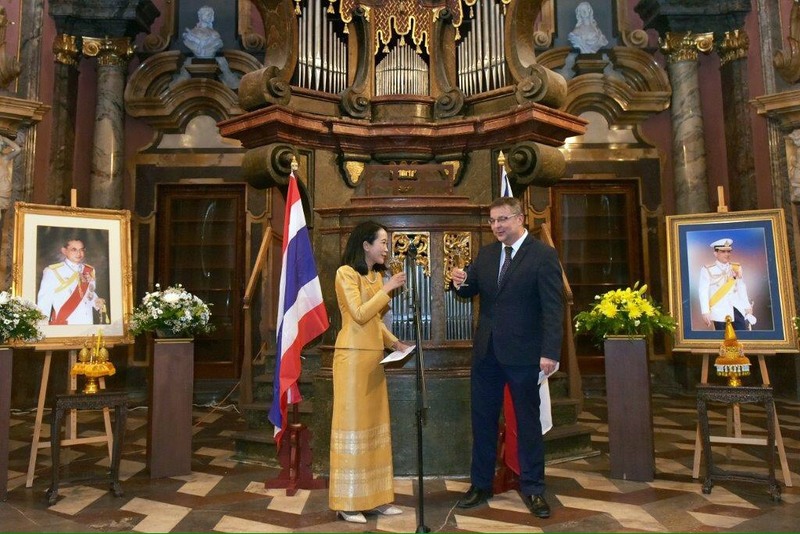 On 5 December 2018, the Royal Thai Embassy hosted the reception to celebrate the National Day of the Kingdom of Thailand, Thailand’s Father's Day and the birthday anniversary of His Majesty the late King Bhumibol Adulyadej at the Mirror Chapel, Klementinum, Prague. 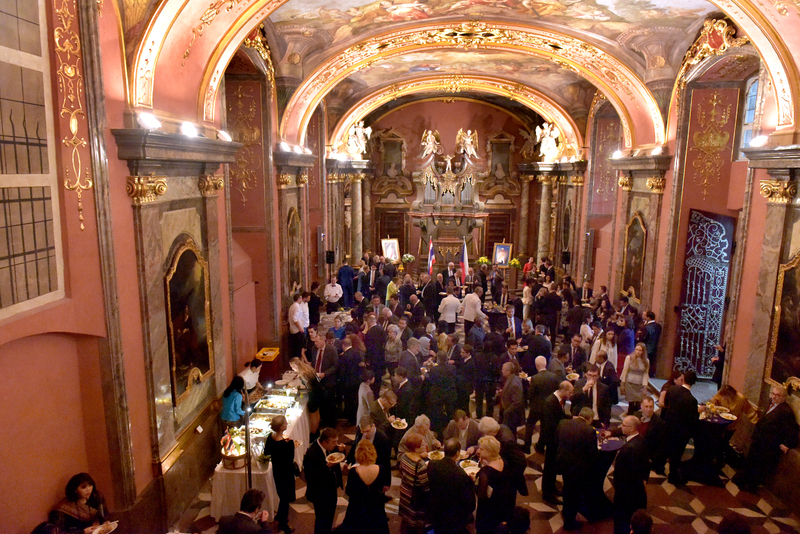 There were approximately 200 participants including high-ranking officials of the Czech Government, for example H.E. Mr. Jan Knezinek, Minister of Justice, H.E. Mr. Martin Tlapa, Deputy Minister of Foreign Affairs (guest of honour), H.E. Mr. Vladimir Bartl, Deputy Minister of Industry and Trade, and H.E. Mr. Richard Kadlcak, Director of Cyber Security Department, Ministry of Foreign Affairs of the Czech Republic. 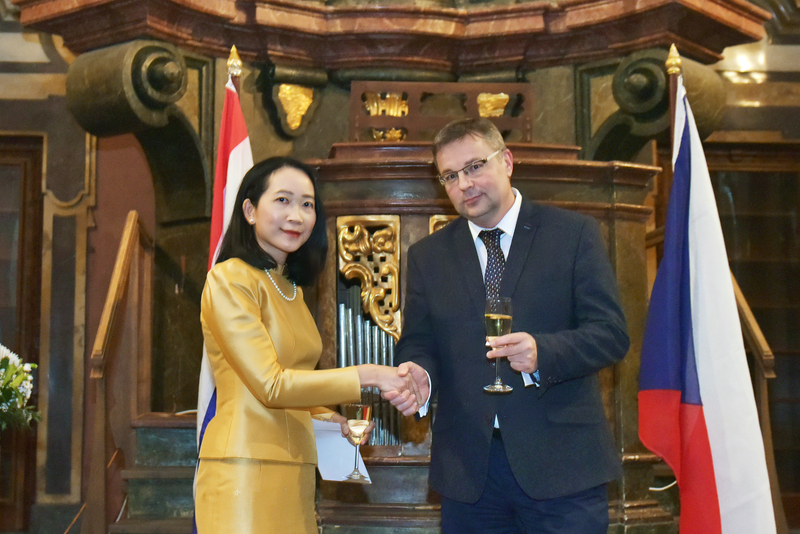 Also present were representatives of the Czech parliament, businesses, academia, media, and members of diplomatic corps, as well as Friends of Thailand in the Czech Republic. In her remarks, Ms. Nattanipa Burusapat, Charge d’ Affaires of the Royal Thai Embassy paid tribute to His Majesty the late King Bhumibol Adulyadej and also praised the strong relationships between Thailand and Czech Republic. The two countries will celebrate the 45th anniversary of diplomatic relations in 2019. Meanwhile, H.E. Mr. Tlapa, as guest of honour, delivered his remarks expressing appreciation of the two countries’ close ties and cooperation. He also expressed confidence in the potential growth of the trade volume of both sides in the future.